Itâ€™s big, itâ€™s bold, & itâ€™s beautiful. Sauerkraut, chilli sauce, & horseradish are friends of corned beef in this sandwich that is sure to satisfy. 1 In a small bowl combine all ingredients for this wonderful Russian Dressing. That is, the Hellmann’s Real Mayonnaise, the chilli sauce, the sour cream, the parsley, chives, lemon juice, Worcester Sauce, and fresh horseradish. 2 Brush the slices of bread with the Russian Dressing, then lay out six slices of the bread on a board. 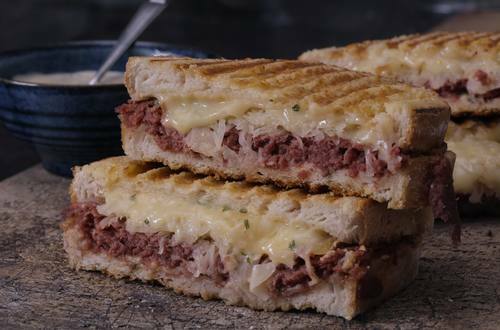 3 Add a generous portion of the sliced corned beef on each bread slice, top with sauerkraut and then the Swiss cheese. Brush some extra Russian dressing on top of the cheese, then top each with the remaining bread slices. 4 Spread the outside of the bread slices, both sides, with Flora Buttery. Place into a hot frying pan, cook until nice and golden then turn over and repeat approximately 4-5 minutes on each side. Serve immediately. 5 Put a date in the calendar later on in the month for when you can set aside time to enjoy another one.